For the fourth consecutive year, Head Start educators gathered to share their strategies for teaching science, technology, engineering and mathematics to infants, toddlers, and preschoolers. This year, the scope of the event expanded from programs in Massachusetts to the inclusion of programs from across New England. Led by Maureen McDonald, Early Childhood Specialist from the University of Massachusetts-Donahue Institute, a committee of Head Start educators representing each New England state developed the plans for this event. In front of an audience of approximately 125 attendees at the Conference Center & Inn at the University of Massachusetts –Lowell, keynote speaker, Johanna Booth-Miner, presented on Mistakes are a Vehicle for Learning –STEM: Natural Trial and Error without Judgement! The presentation highlighted ways to create a classroom environment that values exploration and making mistakes. The presenter encouraged the audience to view mistakes as “unexpected results” or “tinkering”. She emphasized that when children are allowed to make mistakes, it encourages persistence and resilience. In the afternoon, presentations were provided by educators from Head Start programs in Rhode Island and Massachusetts. The topics included ways to promote family and community engagement utilizing community gardening in an urban environment, strategies for embedding STEM throughout all classroom learning centers and seizing on the natural curiosity and inquisitiveness of toddlers to provide enriching STEM classroom experiences. 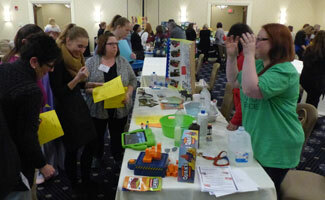 At exhibit tables, teaching teams from across New England illustrated lessons by showcasing artifacts, materials, children’s work, photographs and videos of STEM implementation in classrooms. Exhibits included chemical reactions to make toothpaste, gardening in an urban setting, vermiculture (composting with worms), engineering via The Three Little Pigs tale, the patterns of time, exploring basic physics concepts of gravity and motion, using nursery rhymes to understand how science make things happen and many others. Participants were encouraged to attend, present or exhibit at the 2017 Massachusetts STEM Summit on November 14, 2017 in Worcester, Massachusetts.